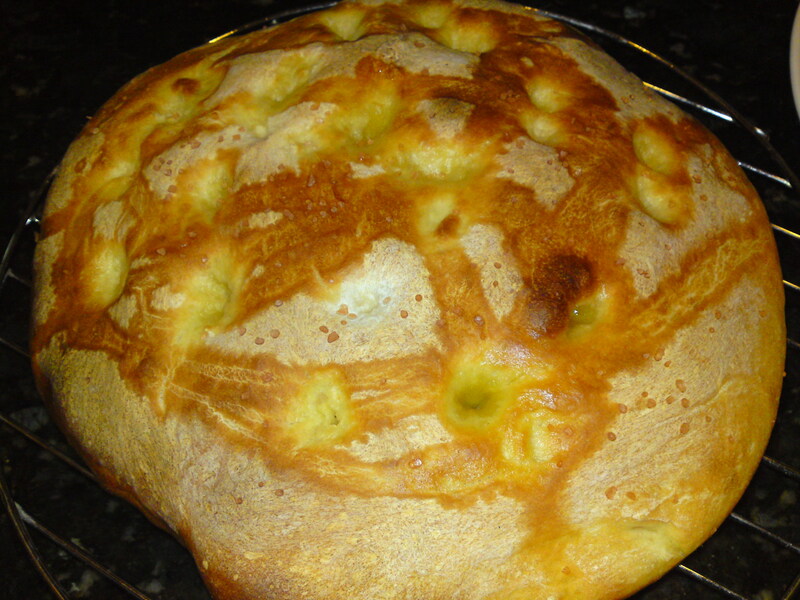 Focaccia. In America, it almost always seems to be billed as a bread. In Italy, however, it’s more like a thick-crusted pizza and often served like an open-faced sandwich. The focaccia I’ve been served here is more or less plain with a an herb or two sprinkled on top, and it’s lovely just like that. But in Italy, there’s much more variety: thinly sliced potatoes seasoned with rosemary and extra virgin olive oil; sweet, browned onions or, my personal favorite, soft stracchino or crescenza cheese melted into a speckled brown and creamy crust. I have yet to make cheese focaccia here in the states. The one time I found imported crescenza cheese in an uppity New York shop, it was two days past its expiration date and well on its way toward wedding-mint pastel. Maybe the author of this cheese-making blog could help us out with a recipe for a nice, soft, focaccia-worthy cheese, but until that happens, I’ll make do with my usual herbed or plain focaccia. It’s always a favorite, even if it does turn out like the bready, American version. 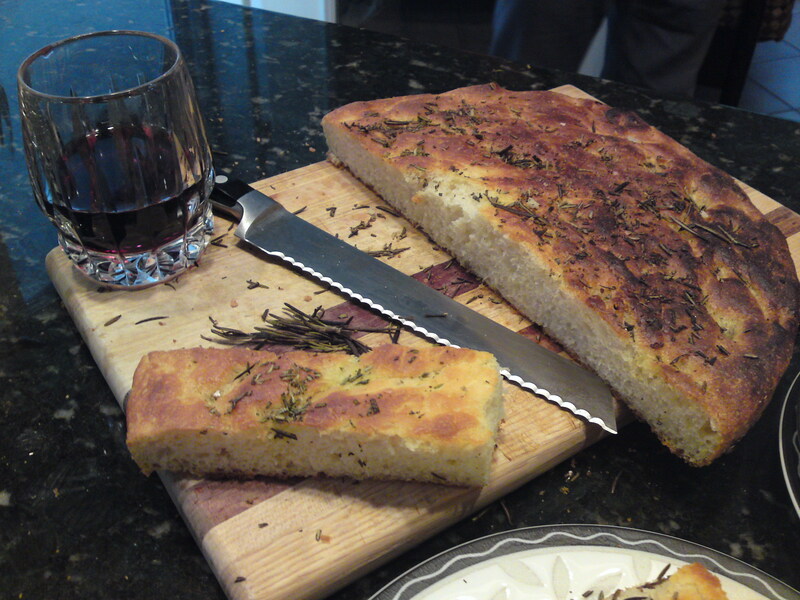 I never considered making homemade focaccia until I received a recipe book and focaccia pan one birthday. I’m not so good about adhering to recipes, and one of the biggest deterrents is when a recipe gets complicated for something that seems so simple. It was the sponge that turned me off — making a yeasty mix and waiting for hours and hours before I could even start the dough. Years later, I did delve into that yeasty, spongy world with my chewy Italian Ciabatta, but a dozen years ago, I wanted something manageable, quick, and fail safe. 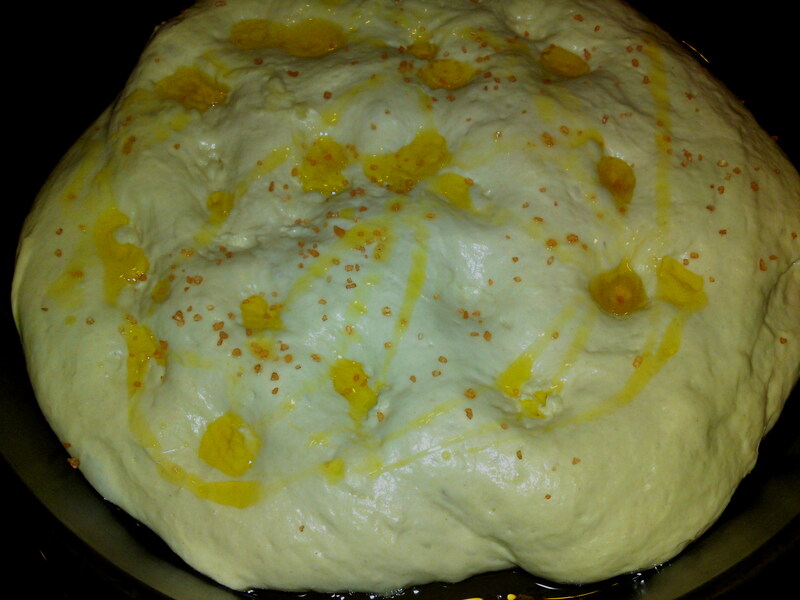 Simple as Sunshine Focaccia was born. As written, the recipe takes about 4 hours between mixing, rising, and baking. But I’ve also made it in barely over an hour. 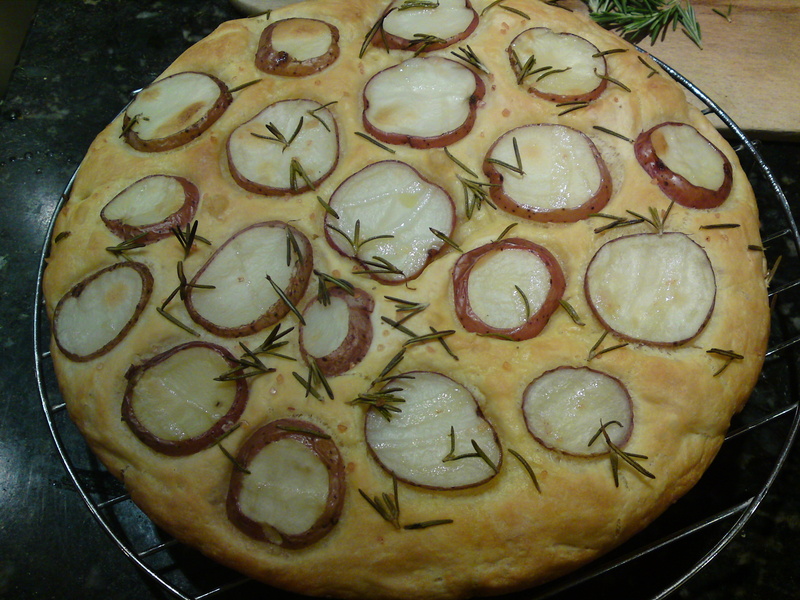 See Speed Focaccia below. Pour the water into your mixer’s bowl, sprinkle the yeast on top and add the salt and sugar. Don’t worry about waiting for the yeast to dissolve. Dump the flour in and mix it in with the paddle until all the ingredients are incorporated — a couple of minutes at most. 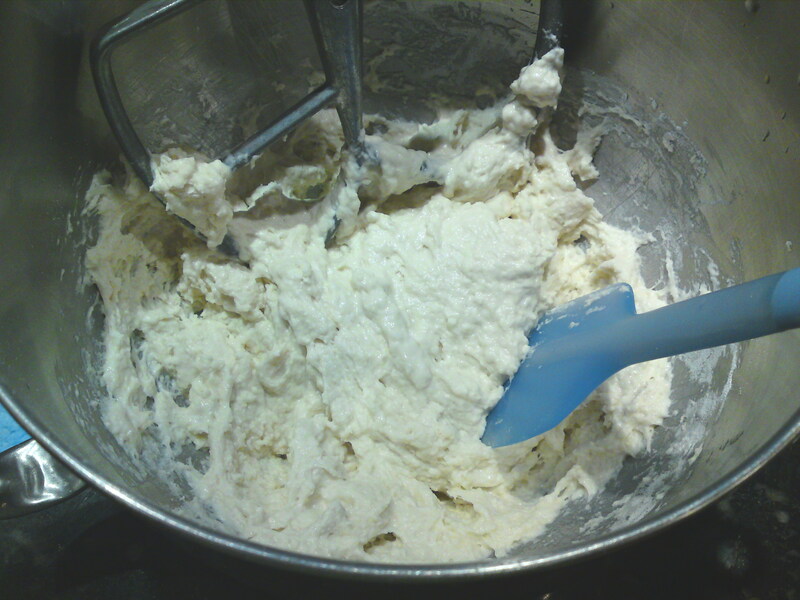 Remove the mixer, drizzle a bit of olive oil on the walls of the bowl, and swirl the dough around with a rubber spatula until it and the bowl are coated with oil. Cover and let sit for an hour or two in a warm spot. Punch down with the rubber spatula. 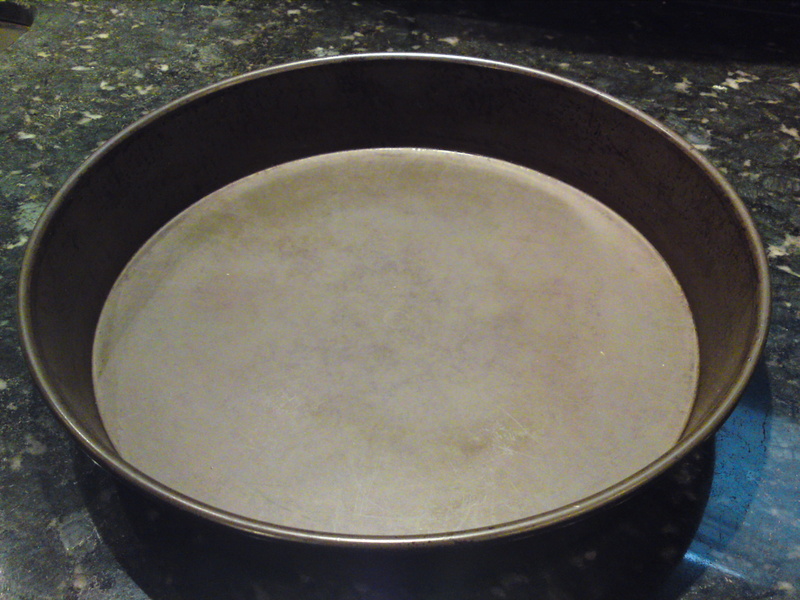 Cover the bottom of your baking dish with a table spoon or so of olive oil and plop the dough on top. Use your fingers to spread the dough into a flattish form and let rise for another hour or so. In the meantime, preheat your oven to 375 degrees. Just before placing the pan in the oven, dimple the top with your fingers or with the handle end of a wooden spoon. Remove from the pan promptly, using a spatula to carefully loosen any area that sticks to the pan. Cool on a wire rack and serve, preferably warm. Doesn’t keep more than a day or so, but no worries. It rarely lasts that long. Pour the water into a deep bowl, sprinkle the yeast on top and add the the salt and sugar. Don’t worry about waiting for the yeast to dissolve. Add the flour 1/2 cup at a time. Mix with a wooden spoon for as long as you can, then use your floured hands to mix until all the ingredients are incorporated. Drizzle a bit of olive oil on the walls of the bowl, and swirl the dough around until it’s coated with the oil. Let sit for an hour or two in a warm spot. Follow from step 4 above. Preheat oven to 100 degrees (or the closest you can get). Mix all the ingredients as in steps 1 and 2 above. Oil the dough in the bowl, cover tightly with plastic wrap, and let rise in the oven for 20 minutes. Remove the dough, and raise oven temp to 375 degrees. Meanwhile, put dough into oiled pan and spread. Drizzle with more oil, sprinkle with salt, and bake as explained above. Fancy Salt: whatever you pour or spread on top, don’t skimp on the salt. I like to use some chunky orange salt someone gave me as a gift some years back. Rosemary-Infused Oil: saute a couple of tablespoons of fresh,chopped rosemary in a couple of tablespoons of olive oil over low heat for a few minutes and drizzle over dough just before baking. Caramelized Onions: caramelize onions and spread over the top just before baking. Olive: Use your finger or a small spoon to dunk halved olives in the dough just before baking. My favorite are the black, semi-dry Greek olives. Save a few to scatter on top. Fresh cherry tomatoes: Just spread them on top and sprinkle with salt just before baking. Chopped, fresh basil is a nice addition to sprinkle on top just before serving. 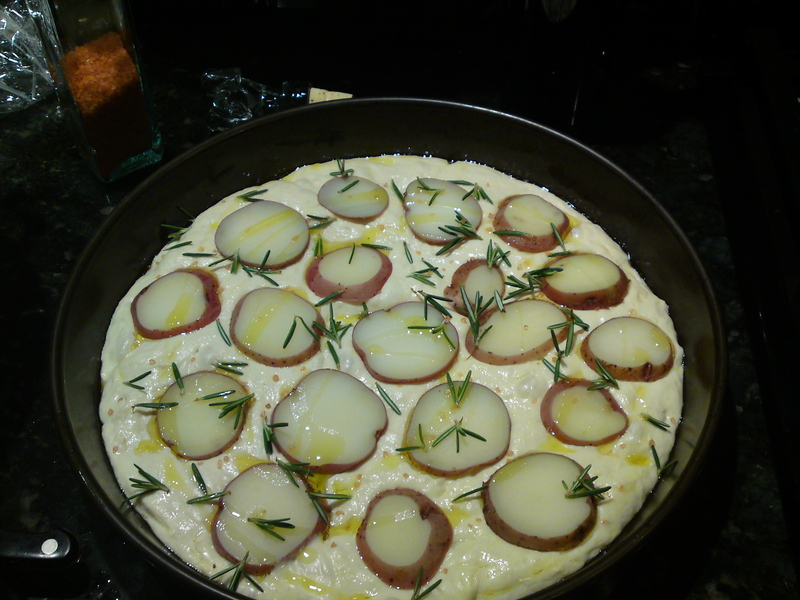 Potato and Rosemary: Slice potato into thin rounds — no more than 1/8″ thick, preferably less. 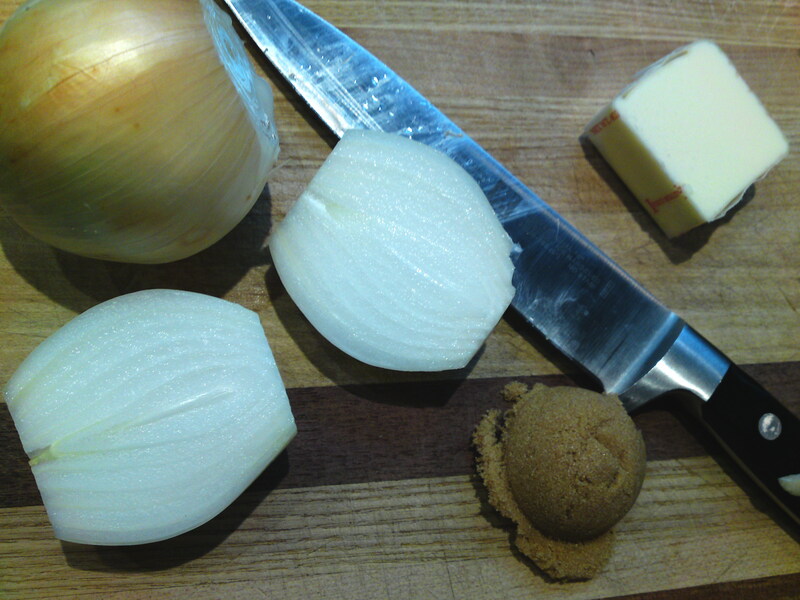 Boil for 4 – 8 minutes (depends on how thinly you sliced them) just until a fork pierces the center without breaking it. Strain and fan across dough just before baking. Top with chopped, fresh rosemary, olive oil, and salt. The possibilities are endless. Travel through the Italian countryside, and you’ll find focaccia with fresh grapes, sweet figs, or savory sage. And every single one of them goes perfectly with a nice glass of red wine.